Creativity, empathy, friendship and acceptance are all wonderful themes to delve into at the beginning of the year with your new class. On Sudden Hill is jam packed with these themes. 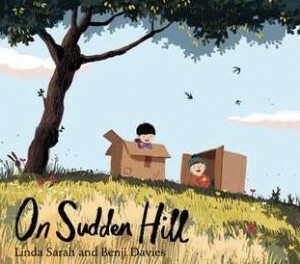 This marvelous children’s picture book, written by Linda Sarah, beautifully illustrated by Benji Davies, and published by Simon and Schuster, 2014 is also available as an e-book. Start your year with our unit of 41 activities based on a Bloom’s and Gardner’s matrix catering for all the abilities and learning styles of the children in your class! Your planning is done for you! 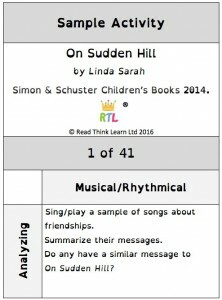 Here is a wee sample activity to tempt you…. 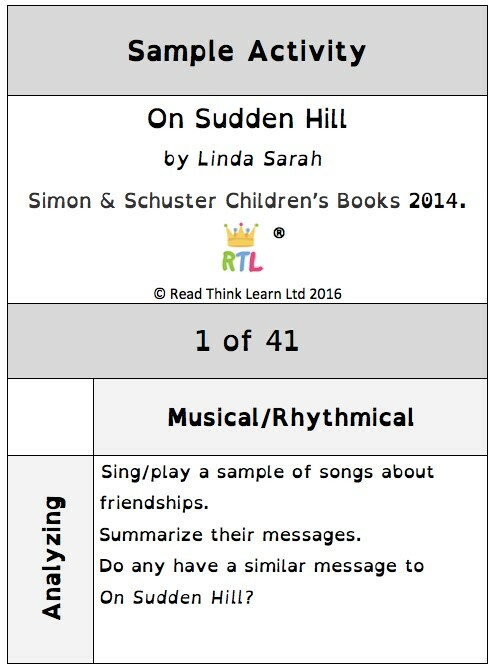 Add the unit to your cart and be inspired by the way it fits so well to the literacy abilities of each and every child in your class.